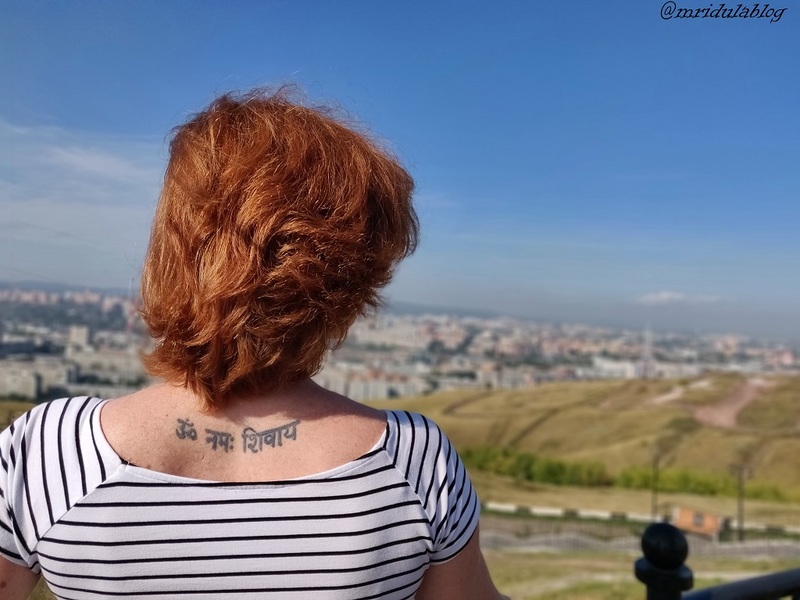 I visited Krasnoyarsk in Siberia in August 2018 as I won a place in the second batch of the Follow Up Siberia Contest. While my thoughts changed a lot by just taking part in the contest, visiting the place was such a beautiful experience. 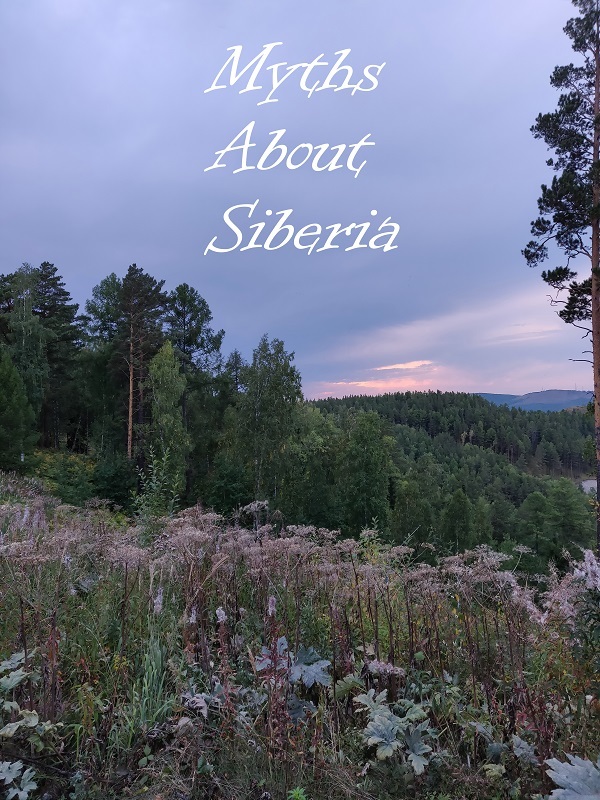 I tried to shake off the stereotypes about Siberia before visiting and did shed many a myths sitting right in my home, but till the very end I thought it would be cold! I cringe and laugh when I see my own video before the trip! But here I am after the trip, ready to bust a few stereotypes associated with Siberia. There is Always Snow in Siberia! Who Took Away the Snow? Almost everyone I met before the trip told me I would find snow everywhere. I always look at the weather before I go any place new or for that matter even old. The weather forecast for my stay in August was 12-29 degree Celsius and light rains. But everyone told me there would be snow and I sort of expected it too! I was a little sad actually to find no trace of snow anywhere at all! 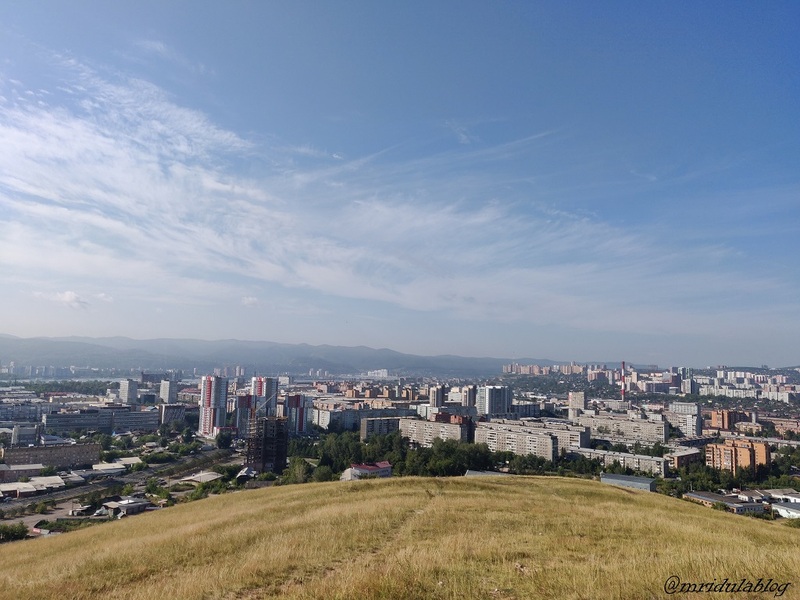 The Verdict: There was no snow, not even a sign of it when I visited Krasnoyarsk, Siberia in August 2018! No Snow in the Summer? But It Will Be Very Cold Out There! Victoria Natrobina our Host with her Om Namah Shiyay and Heavy Winter Clothes! I fell for this one for sure, listen to me in the pre-trip video! Even after looking at the temperatures in advance I somehow thought it would be cold! I had two light sweaters and one shawl with me. I did feel a little cold the first night as I was tired after my Delhi Moscow flight. Moscow Krasnoyarsk was another 4 hours of flight the very next day. But from the second day in Krasnoyarsk all the warm clothes firmly stayed in my hotel room. One day, the temperature reached 30 degree Celsius in the afternoon! The Verdict: Siberia does get a summer, in August the weather was mild and pleasant. It was not cold at all in August. When I thought of Siberia, I thought of wide open spaces! 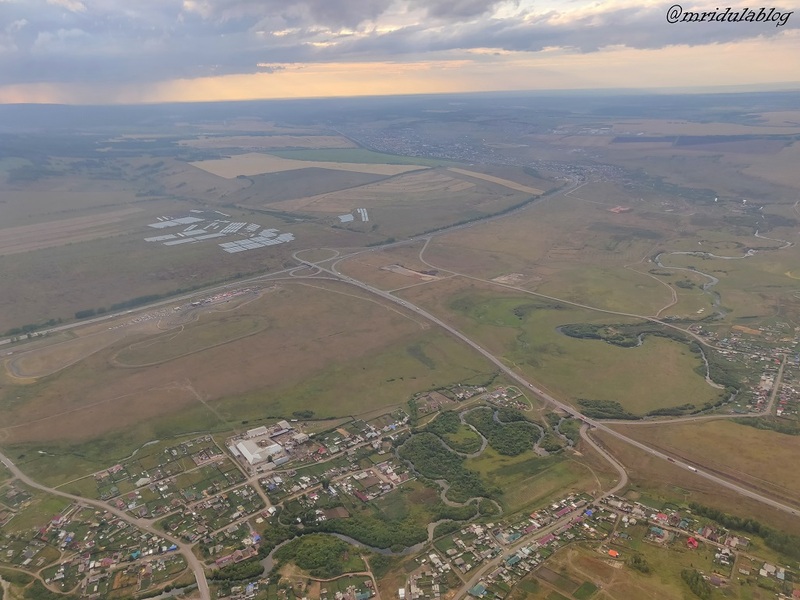 No doubt if you move out of the city center of Krasnoyarsk, there are wide open spaces. But the city is home to one million people! And it is modern. So get used to finding people around you! The Verdict: One million people live in Krasnoyarsk alone! But Not in the City Center! If you are seeking wilderness you will have to go and visit the Stolby Nature Reserve near Krasnoyarsk. Just don’t expect it in the city center! 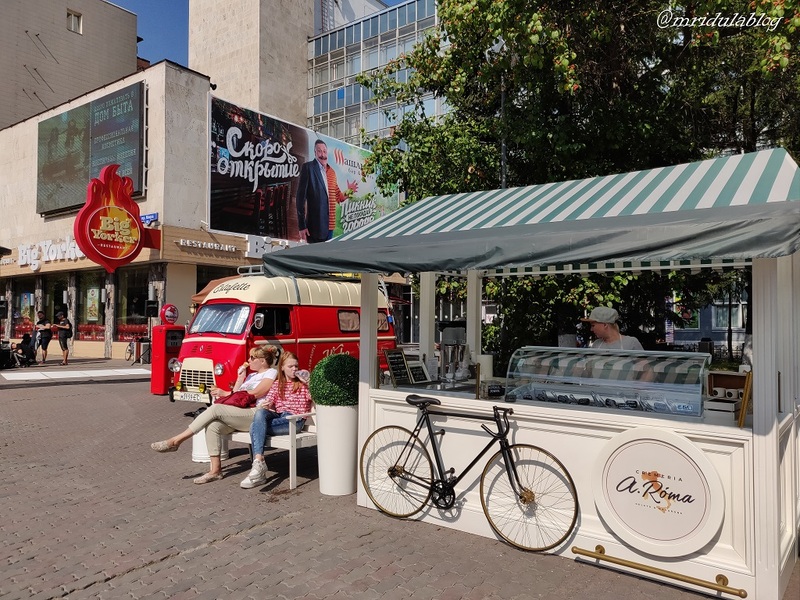 For in the city center you will find a Subway and a pub named New York! Also the Novotel where I had a comfortable stay. The Verdict: You can find wilderness but not in the city centers! 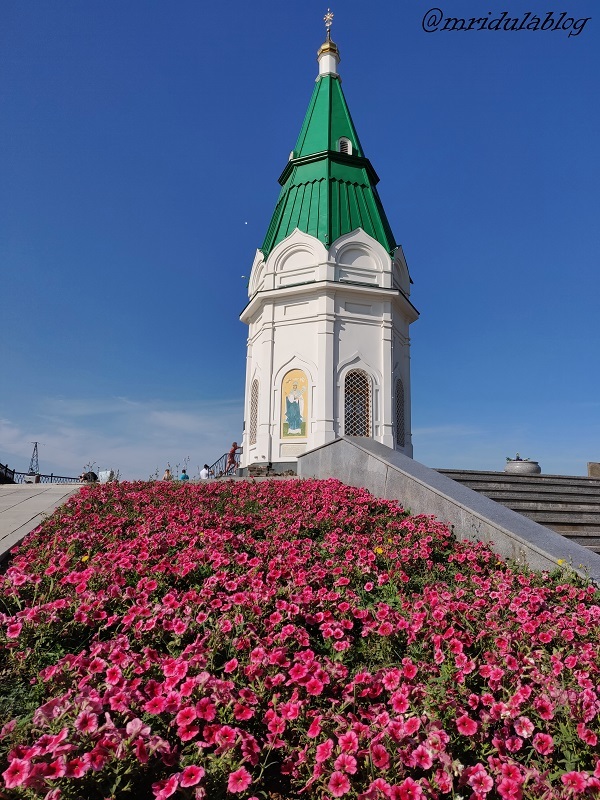 On the contrary you will find flowers everywhere in August in Krasnoyarsk, be it the city center, near the churches or in the wild. The Verdict: Count the number of flowers in the picture and then tell me nothing grows in Siberia! There are Bears on the Road! The Only Bear that I Saw in Siberia! Not a chance of this one being true! 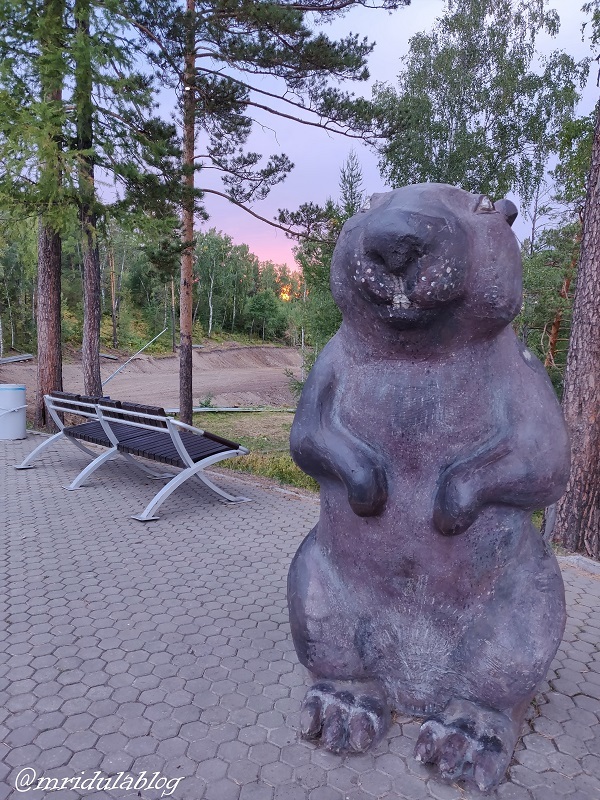 How many bears did I saw in Krasnoyarsk Sibera? A big fat zero, same as the first set score for Rafael Nadal vs. Dominic Thiem in the US Open 2018 quarter final, Nadal 0, Thiem 6. It is another matter that Nadal went on to win the match! The Verdict: There are no bears on the road! Svetlana Yushkova and Her Beautiful Smile! I don’t know where this one comes from! I visited only two places, Krasnoyarsk and Moscow and there was no dearth of people smiling. 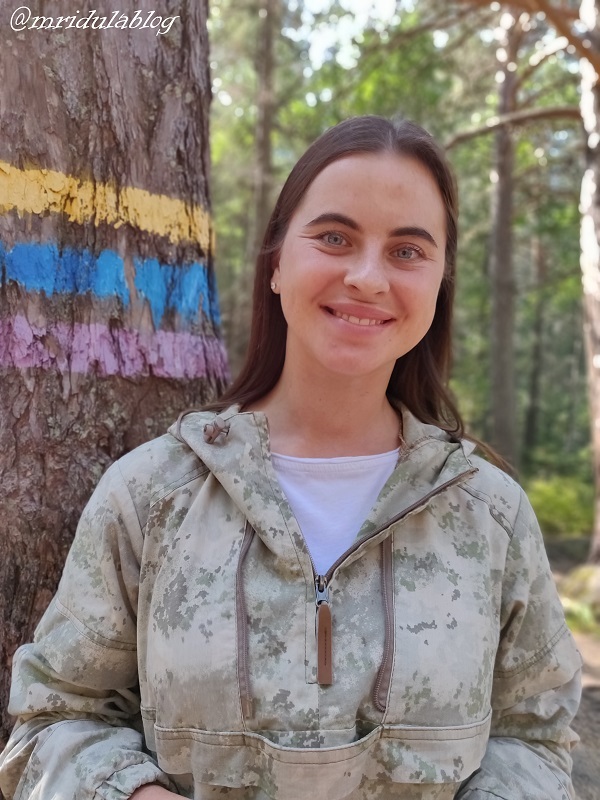 I met so many smiling people in Krasnoyarsk, Svetlana Yushkova being one of those gentle, genial souls! We met her in the Stolby Nature Reserve and she absolutely made our day with her guiding through the forest! The Verdict: While I don’t find Russia on the top of my list of sorry/thank you stand in the queue nation but smiling and warm they surely are! Kvass a Local Russian Drink! Unfortunately this is also not true! You can drink Vodka, but you get to drink so many other type of alcohol too, like wine, beer or the local drink Kvass! No shortage of coffee as well! Like any other place in the world you have many drinks to choose from! 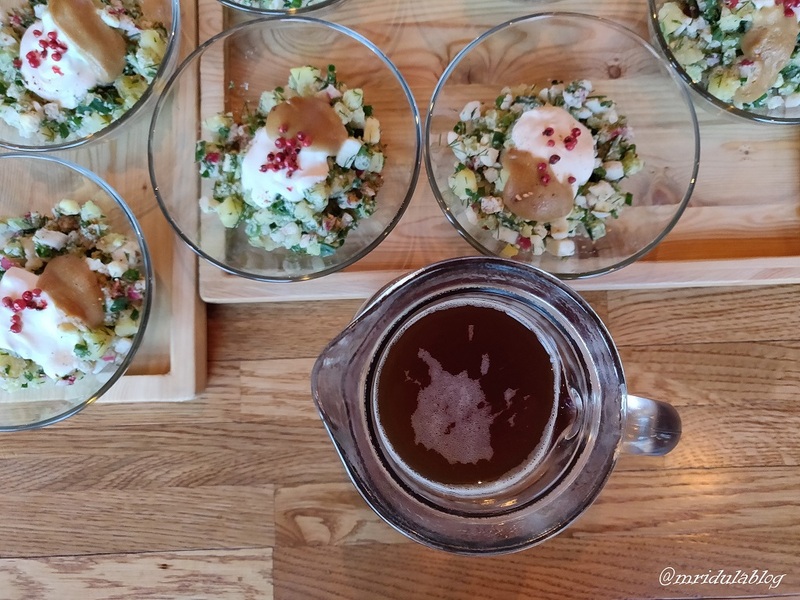 The Verdict: Choose Kvass if you wish to have a local experience. So, if have a trip to Siberia in summer do not expect snow, cold and bears. However, do check the temperatures before going anywhere in the world!